Size matters, and in the ocean small is beautiful. Survival of the fittest is represented by navigation and weather buoys known to live on for decades, and some even for a century in the ocean. The Waves4Power buoy is like the weather and navigation buoys – an expert on survival. The size, shape, and mooring system of navigation buoys are well tested and proven over a long period of time. W4P is using an identical concept and our power-generating buoys are in all aspects similar to weather and navigation buoys, which ensures their survivability. The trick is not to fight the waves but ride them. By building small buoys in relation to the waves in which they work, you place the odds of survival on your side. The Waves4Power buoy at Runde is an 8-meter diameter buoy, optimized to ride the wave while harnessing the greatest possible amount of ocean energy without exposing itself to the ocean’s devastating forces. 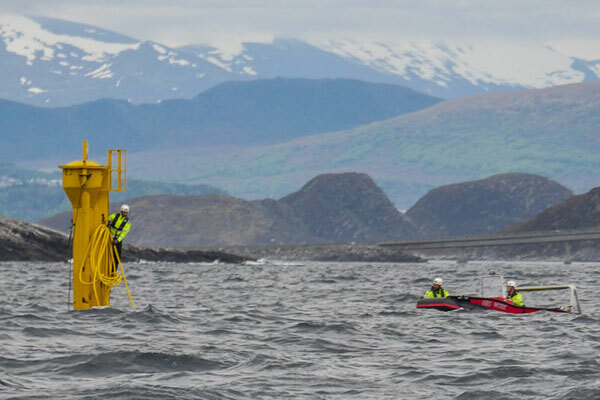 In the wave climate where the Waves4Power system performs the best, there will be but few opportunities when the weather allows for a visit to the wave power buoy. Accessibility, then, is key. From the very beginning, the advice from our marine and dive operations partners has been to follow their no. 1 rule. “Build your system so it is always serviceable without the need for divers…we dive for a living so we know just how expensive and hard it is to maintain a system that requires anything but a small rib boat to get to”. With this advice in mind, the Waves4Power system is designed for optimal serviceability from small boats and large service vessels alike. 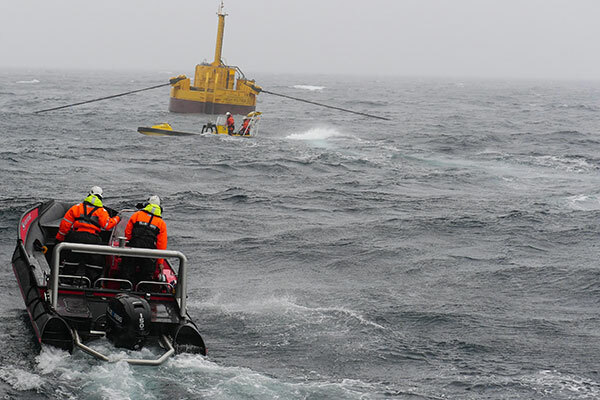 All systems are placed above water in the buoy itself as well as in the connection hub where the low voltage cable from the buoy meets the subsea shore cable. All electric connections in the system are dry without need for expensive “Wet Mate” connections. The WaveEL 3.0 buoys are built with all components placed in modules that are easily replaced with no need to move the buoy from its moorings. The modular concept reduces service time at sea where the cost of operations is the highest. The module in need of repair is brought to shore where the job can be performed in a dry, clean, and accessible environment. Furthermore, the hydraulic conversion system – with the exception of the hydraulic ram – is placed inside an air tight, stainless steel vessel minimizing the risk of spill or leakage of oil from the system. The oil used in the system is naturally bio degradable. In the design phase, the O&M (Operations and Maintenance) challenges were already considered and solutions were pre-emptively built into the system. The monitoring system W4P has developed with its partners and suppliers is capable of not only monitoring and recording output performances, but also monitoring the condition of individual key components. They do this through the use of built in sensors and determine the preventive maintenance needed before a break down is imminent. 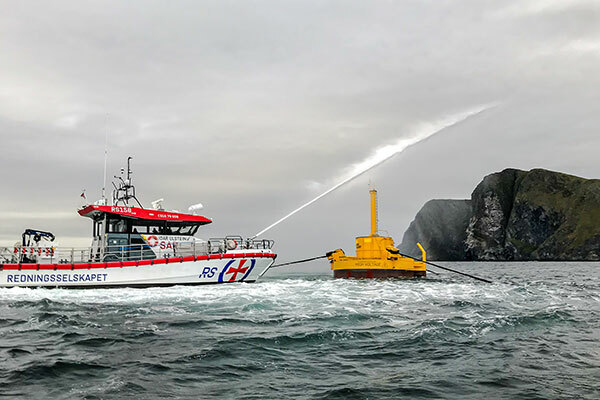 This state of the art technology is particularly important for a wave power installation as the cost of service is very high and the window of opportunity to perform service and access the wave power buoy may be very limited during parts of the year. The four key parameters that determine the cost of power produced are easily defined, but not as easily obtained. They are as follows: manufacturing cost, launch and retrieval cost, lifetime maintenance cost, and system efficiency/output. The cost of building a wave power device is dependent on the amount of raw material needed. For this reason, the parameters of kWh produced per unit of weight have lately become a key factor in comparing different systems. The WaveEL 3.0 buoy has one of the highest outputs per unit of weight [kWh/year/kg] known to the industry. The launch of wave power systems on the whole has traditionally been both expensive and quite dangerous, with multiple failures during launch or transport to deployment site. Wave4Power has showed the feasibility of using smaller devices than many of our competitors. This ensures ease of handling during deployment, among other benefits. Waves4Power’s unique logistics approach from start to finish guarantees these “small” units are perfectly suited for mass production. As production volume increases, the cost is driven down and the positive effects of learning curve improvements are fully realized. Cost of Operation and Maintenance during the 25-year lifetime of the device amounts to a substantial sum. The WaveEL 3.0 buoy’s accessibility and modular design minimizes O&M cost. 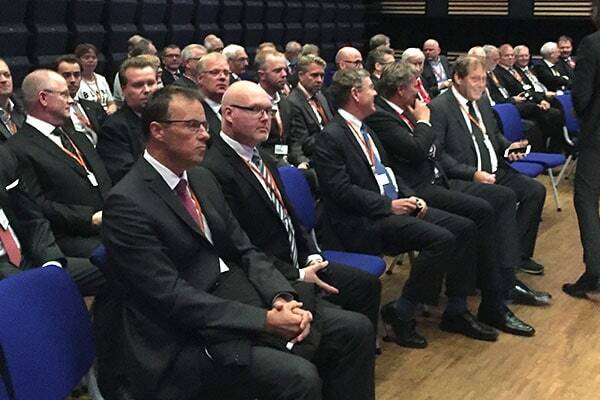 Waves4Power has built a unique network of industrial partner companies. Each partner company is an industry leader in their respective field of business, and they take full responsibility for their solutions in the complete Waves4Power system.